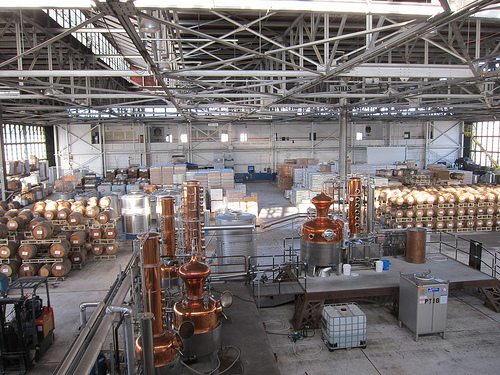 One of the things I most wanted to do when I visited SF was to go to Alameda to visit the St. George Spirits distillery. Next Friday, November 30th, St. George Spirits will throw a party for “Thirty Years Under the Influence: St. George’s Tale of Liquid Courage.” The $75 ticket ($60 for members) includes a grand tour, 3 specialty decade-inspired cocktails, hors d’oeuvres, a panel discussion and after party! For more info and tickets, check out this page. For those who can’t make it, let’s go to the distillery via pictures. There’s a lot of booze being made! Wonder which still has B&E? 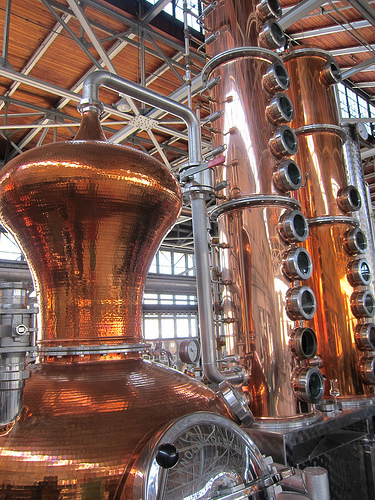 I haven’t been to very many distilleries and when I saw all those shiny Holstein stills, I fell in love. They looked like copper musical instruments. 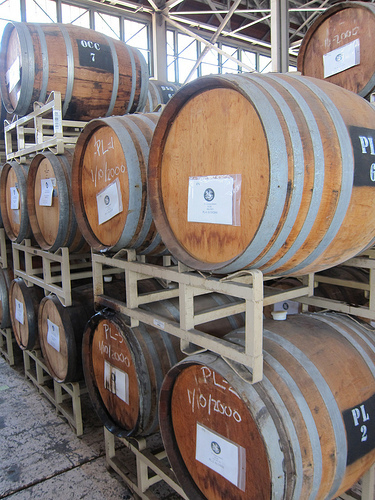 I love that St. George re-uses barrels. Being a history geek, I liked looking at all the old stamps from previous distilleries. Let’s talk about gin for a bit. 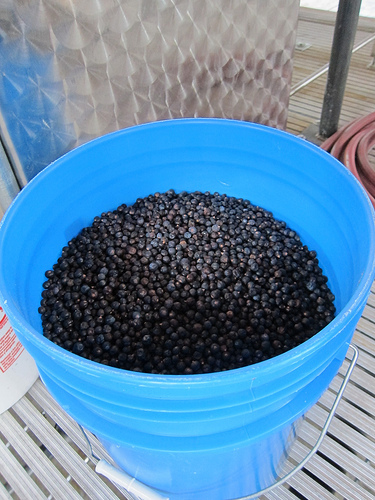 We had a chance to touch and smell juniper berries. I’ve smelled the dried stuff before but it was cool to see fresh ones and roll one around my palm until it was stained red. 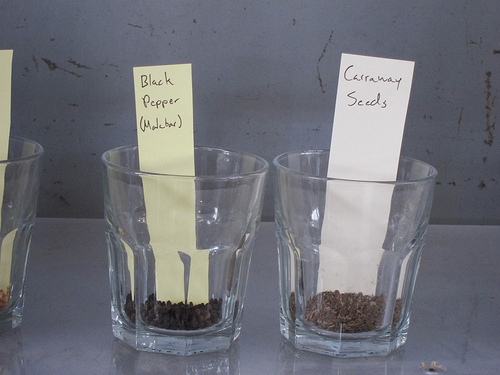 We also smelled the various botanicals that go into the gins. 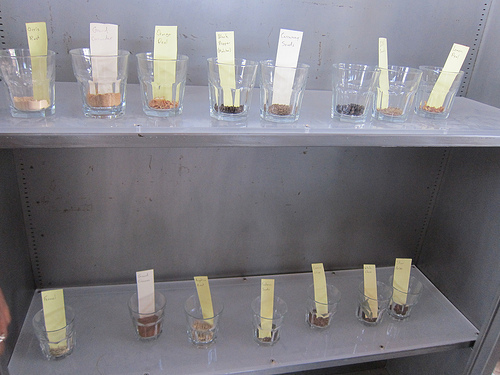 St. George has three; Terroir, Bontanivore and Dry Rye. 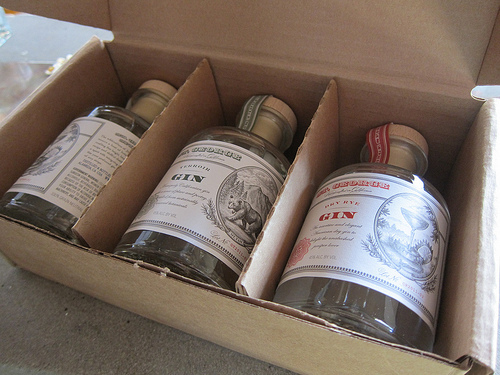 (There is a fourth they make for K&L Wines but it’s a private label gin specifically for K&L). 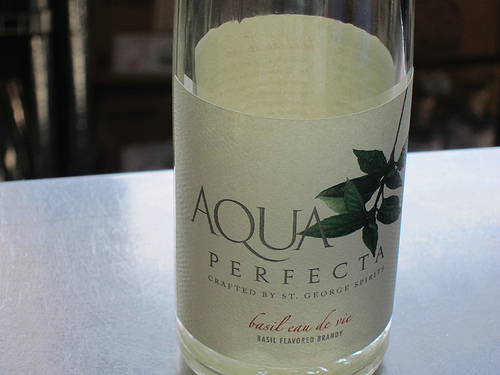 I had not realized St. George also had eaux di vie but in fact, the distillery was started by Jorg Rupf with his original eau di vie. Of the ones I tasted, I loved the basil one. 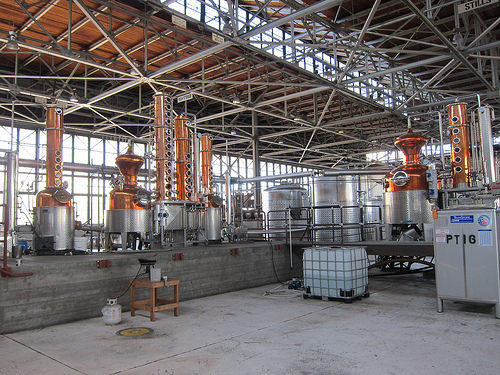 St. George is also well known for their absinthe. 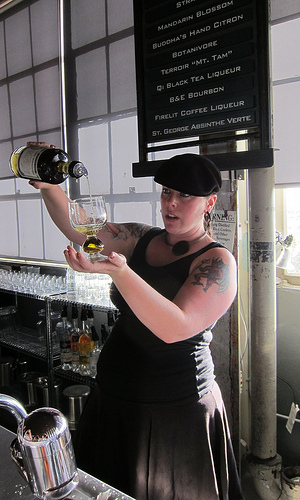 Here St. George vixen Andie shows us you don’t need an absinthe drip to drink absinthe. Mix the absinthe with a little water and you got yourself something to sip on. Add some root beer and you have a drink! 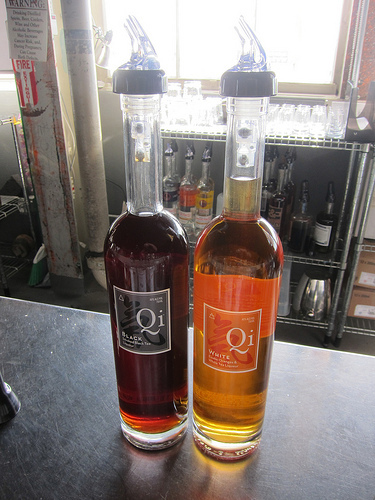 We tasted many, many things including several of the Hangar One vodkas but I was intrigued by the Qi (pronounced “chi”) liqueurs. They’re a bit on the sweet side so whatever cocktail you’re making, I’d reduce the sugar. 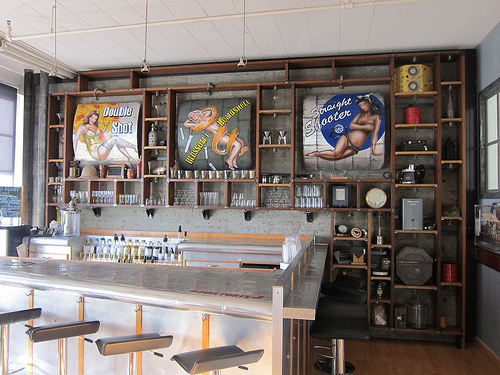 There are a couple of bars at St. George including 2 upstairs. The smaller one features some rather interesting artwork. Perhaps you need a dram or two before the “ladies” will intrigue you. 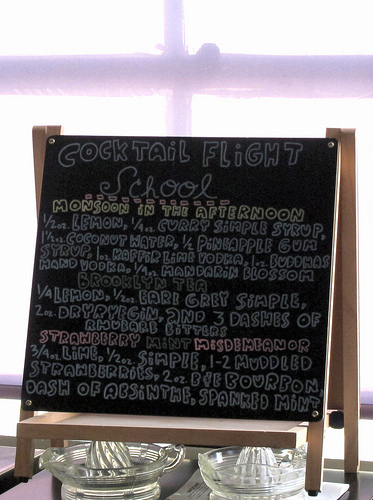 Over in the larger bar where most of the classes and special events are held, there’s a “cocktail flight school” menu. Oh what to get? While some of the ladies in my tour group opted for the Breaking & Entering bourbon, absinthe or the basil eau di vie, I chose the baby gins. They’re just so adorable. Dry Rye is great in whiskey-type cocktails, bontanivore is herbacious and I like it in fruitier drinks and then there’s the mysterious terroir that’s wonderful in classic gin cocktails. If I was in SF next week, you know where I’d be. 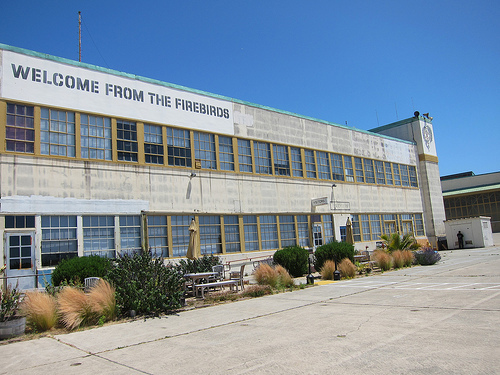 This entry was posted in alcohol education, alcohol tasting, events, history, spirits, travel and tagged 30 years under the influence, alameda, classes, distillery, distillery tour, event, san francisco, sf, st. george spirits, the minty, tour, travel. Bookmark the permalink.